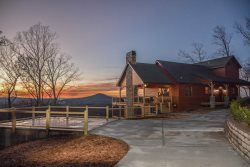 DANCING BEAR- 3BR/3BA- MOUNTAIN VIEW CABIN SLEEPS 6, GAS GRILL, WIFI, FIRE PIT, GAS LOG FIREPLACE, JETTED TUB, POOL TABLE, FOOSBALL, AND SATELLITE TV! STARTING AT $139 A NIGHT! This cabin has it all….awesome screened in porch with a Seasonal View. Cabin offers renters 3 bedrooms (queen beds) and 3 baths…there is a bedroom and bath on each level of this log cabin and a Futon in the game room. Master bedroom has its own private deck, and the master bath offers you a corner Jacuzzi tub and separate shower. The decor is great throughout the entire cabin. Main living area offers a fully furnished kitchen, dining area…awesome gas fireplace with leather sofa and chair. Lower level offers a great game room with a pool table, foosball, large screen TV, dish and they offer the use of a play station 2. From the lower level you will find a firepit down in the lower yard area and hot tub. Open deck on the main level offers a great gas grill for those nights of grilling burgers, steaks…what ever you are in the mood for. We rent all year round, we look forward to talking with you about a simple week end getaway, Honeymoon….or for your week of vacation. Nearby attractions include hiking the beautiful trails of North Georgia, biking, Antique Shopping, White Water Rafting, Horseback Riding, Scenic Train Rides and the famous Swan Drive In. All of our cabins include linens, dishes, pots, pans, towels, washcloths, etc... We will provide an initial supply of guest soaps, toilet paper, dishwasher detergent, paper towels and trash bags. We suggest that you bring your supplies for an extended stay of paper towels, trash bags, and washing powders. UPPER LEVEL: MASTER SUITE WITH QUEEN BED, FULL BATH WITH WALK IN SHOWER AND JETTED TUB. LOWER LEVEL: QUEEN BED, FULL BATH WITH WALK IN SHOWER, FUTON, GAME ROOM WITH POOL TABLE, FOOSBALL TABLE. This cabin is cozy, warm and inviting! A wonderful respite at the of a day of hiking Amicolola Falls! You will love! We did! Customer Service Was Beyond Amazing! Enjoyed The Location Of the Property. Very patient and courteous staff, no problems at all. Absolutely love tht each floor has a big bed and bath. The top bedroom floor has walk in closet and private balcony which we loved!! We enjoyed our stay so much we will be back. Being able to witness my girls and nephew smile was priceless. This was definitely a memorable moment to add to our life journey. They will forever remember this! Thank you! I went along with two other couples and we had a blast! The area is quiet and there was plenty of room. Playing games in the first floor game room was fun and you could go relax in the hot tub when you wanted to. The middle floor was a nice place to lounge around and sit by the fireplace. Good kitchen to make and serve lots of food and drinks for everyone. Third floor is the master bedroom suite and has its own balcony. I personally liked it but due to the weather it was a little too cool outside for my liking. All the bedrooms have balconies but the master bedroom had a couples balcony with nice rocking chairs. The grill is gas and is very easy to use. GREAT PLACE TO GO TO AND WILL DEFINITELY BE GOING BACK SOON. It was great to get a response as soon as I send an email. The kids had so much fun in and around the cabin. It was well kept and we had everything we needed. We loved it! Can't wait to go back! Love this property. Nice, cozy stay. Nick was absolutely amazing in helping me move our cabin dates and location when we had a last minute delay. He was super friendly and very helpful.